Older adults are especially susceptible to extreme forms of acid reflux, which can harm the esophagus and cause problems eating and drinking. 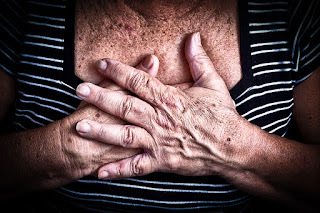 More than 60 million Americans experience heartburn at least once a month, and some studies have suggested that more than 15 million Americans experience heartburn symptoms, also known as acid reflux, each day (American College of Gastroenterology). Because of physiological changes, plus prescription medications that affect the GI tract, older adults are more likely to suffer from a more serious form of acid reflux known as gastroesophageal reflux disease, or GERD. So, there’s a good reason why your bathroom shelves are loaded with bottles of Pepcid, Gaviscon, Tagamet and Maalox, and why you’ve had to stop eating some of your favorite dishes, like burritos and spaghetti with marina sauce. You experience heartburn as a burning pain in your chest, just behind your breastbone (and not actually in your heart), often after you eat or at night. The pain is usually worse when you are lying down or bending over. It’s known as acid reflux because stomach acid backs up into your esophagus (the tube that transports food from your mouth to your stomach). In a healthy esophagus, after food and liquid flow into your stomach, the esophageal muscle tightens. But if it’s weak, a trait common in older adults, the acid can come back up and cause a burning sensation. Smoking. This habit inhibits the production of saliva, which neutralizes acid’s effects. Tobacco may also stimulate stomach acid production and relax the muscle between the esophagus and the stomach, permitting acid to flow up. Consuming certain foods and beverages. Chocolate, coffee, peppermint, greasy or spicy foods, tomato products, citrus juices and alcohol can all create acid. Avoid the nightcap before going to bed. Being overweight. Excess pounds put pressure on your abdomen, pushing up your stomach and causing acid to back up into your esophagus. Eating before sleeping. Because stomach acid helps break down food for digestion, you need two to three hours for acid levels to decrease before lying down. You might want to think about elevating the head of your bed if your heartburn occurs during the night. Simply raising the head with a few blocks or, if you prefer, sleeping with more pillows to keep the head up can be helpful. Stress. Anxiety can worsen heartburn symptoms. Your heartburn might be more serious than you think. If you agree with two or more of the questions in the quiz below, you may have GERD. To know for sure, see your doctor or a gastrointestinal specialist. an uncomfortable feeling behind the breastbone that seems to be moving upward from the stomach? a burning sensation in the back of your throat? a bitter acid taste in your mouth? Do you often experience these problems after meals? Do you experience heartburn or acid indigestion two or more times per week? Do you find that antacids only provide temporary relief from your symptoms? Are you taking prescription medication to treat heartburn, but still having symptoms? Antacids. By helping to neutralize stomach acid, antacids such as Maalox, Mylanta, Tums and Gaviscon may provide quick relief. However, they can't heal an esophagus damaged by stomach acid. Frequent antacid use can also cause diarrhea or constipation. H2-receptor antagonists. Also known as H2 blockers, these medications actually reduce the production of stomach acid, therefore relieving heartburn for a longer period of time than antacids. However, they don’t act as quickly, which is why many people grab an antacid first. H2 blockers, which include Pepcid, Tagamet and Zantac, can help heal mild to moderate esophagitis. Proton pump inhibitors (PPIs). For more severe cases, doctors will prescribe PPIs, which include Prevacid and Prilosec. PPIs have been found to reduce more acid and heal esophagitis more rapidly than H2 blockers. However, several recent studies have shown links between PPIs and some serious illnesses. One study reviewed data from 16 million clinical documents and found that people who take PPIs have a greater risk of suffering a heart attack, regardless of whether they have a history of cardiovascular disease (Pharmaceutical Journal). Another study linked PPI to increased risk of developing kidney disease (Medline Plus). The findings are based on medical records from over 173,000 VA patients who were prescribed a PPI and more than 20,000 other patients given H2 blockers. Over five years, 15 percent of PPI users were diagnosed with chronic kidney disease, versus 11 percent of those on H2-blockers. After the researchers weighed other factors, PPI users still had a 28 percent greater risk. PPIs work by blocking production of stomach acid, which helps digest food and acts as a barrier against certain pathogens. Without the stomach acid, people are more vulnerable to nutritional deficiencies and infections, according to one researcher, because you’re not getting the vitamins, minerals and other nutrients you need. Nutrient deficiencies and bone-density loss is especially a concern for older adults. Another recent study raises concerns about PPIs causing dementia. The German Center for Neurodegenerative Diseases in Bonn studied 73,679 people ages 75 and older. The researchers found regular PPI users had at least a 44 percent increased risk of dementia compared with those not using the drugs (NPR). Although it’s not clear how PPIs might increase the risk for dementia, other researchers studying mice have reported that PPIs seem to increase levels of beta-amyloid, a damaging protein that accumulates in dementia patients’ brains. None of these studies prove that PPIs are directly to blame for these problems, only that there is a link. However, medical experts advise that patients should only take them when their acid reflux or GERD is severe. Many prescribers are having their patients taper off of them periodically or switch to other H2 blockers or antacids. Instead of relying only on drugs, people with acid reflux/GERD should consider diet and lifestyle changes, such as eating less spicy foods and losing weight, experts advise. To relieve the discomfort of acid reflux, you can also raise the head of your bed. “Acid Reflux,” American College of Gastroenterology. “Senior GERD: Symptoms & Care,” May 6, 2015, A Place for Mom. “Aging and Digestive Health,” WebMD. “Common Heartburn Drugs Linked to Kidney Disease in Study,” April 14, 2016, Medline Plus. “Popular Heartburn Pills Can Be Hard To Stop, and May Be Risky,” Feb. 15, 2016, NPR. “Proton pump inhibitors are associated with increased risk of heart attack,” June 15, 2015, The Pharmaceutical Journal.